The Table of Contents is such a useful feature, it makes me wonder why I never included it before. Same with the Troubleshooting Guide. It's a lot of the same information you'll find on our Support page, but you won't have to exit the PDF to find your answers. The rewordings were mostly removing references to living males (Ryan Seacrest, David Copperfield, LL Cool J, Wolfgang Puck, Mick Jagger, Bruce Springsteen...). It seemed like the right time to retire the "Crackberry" award. We all recall the Blackberry fondly, but - much like an aging PC - it's memory is starting to fade. There was also an reference to the OLD Stephen Colbert show that has been removed. And I took out references to Al Gore, Dr. Phil, and Marvin Gaye because. No major rewording changes here. I reworded a few awards to make them more gender-neutral or otherwise non-specific. We took out some references to older pop culture moments (remember when Pippa Middleton upstaged Kate's wedding? ), removed referrals to those who are no longer with us (R.I.P. "Brangelina"), and said goodbye to TV shows of the past (sorry "Duck Dynasty", "Fear Factor" and "Toddlers and Tiaras" fans). And perhaps, most importantly, scrubbed out references to any living males who might find themselves embroiled in a scandal at some point. So it's adios to awards named after Justin Beiber, Lil' John, Hugh Grant, Howard Stern, Jerry Springer, and yes - even Tom Hanks. And it's easy to offend. That's why I've done the hard work of coming up with unique wording for over 400 funny award certificates. But use your own judgement. I've made it easy to tweak the award titles and descriptions if there's any concern at all that someone might get upset. Remember that it's OK to laugh at ourselves. Ten years ago a Global phenomenon was launched with the first edition of “Funny Employee Awards” by comedian Larry Weaver. 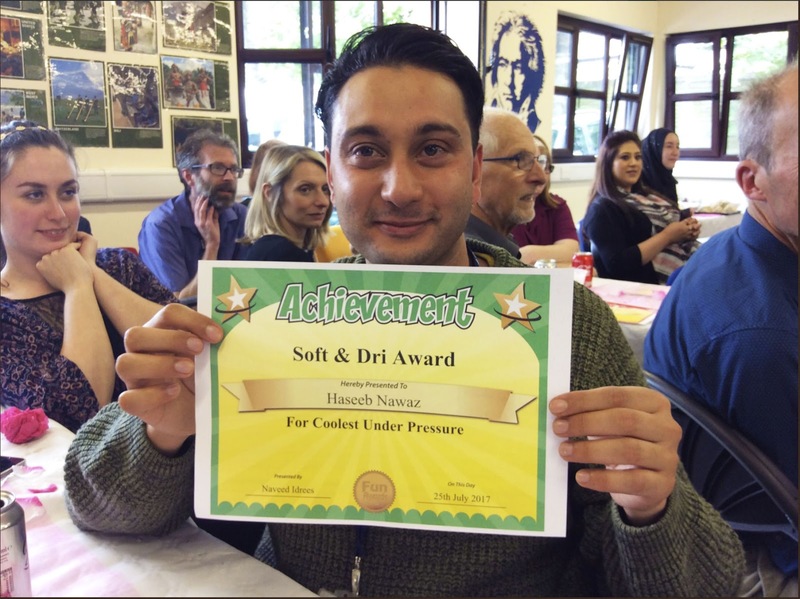 These cheeky awards have been a long-time favorite in the United Kingdom. 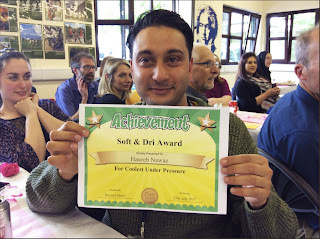 We've since expanded the collection with "Funny Office Awards", "Funny Award Certificates", and "Funny Teacher Awards". 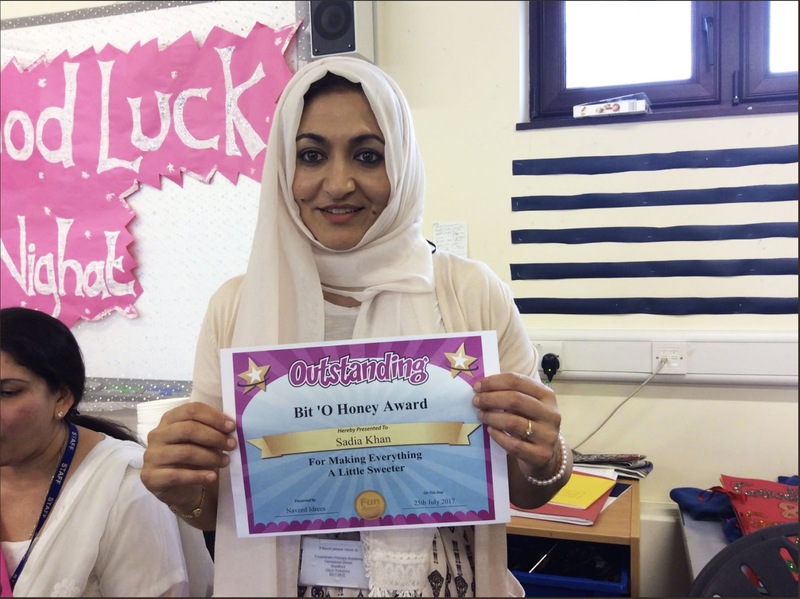 These Funny Awards UK photos are from Feversham Primary Academy in Bradford, England (courtesy @FevershamSchool on Twitter). Note that some have been altered with customized wording. 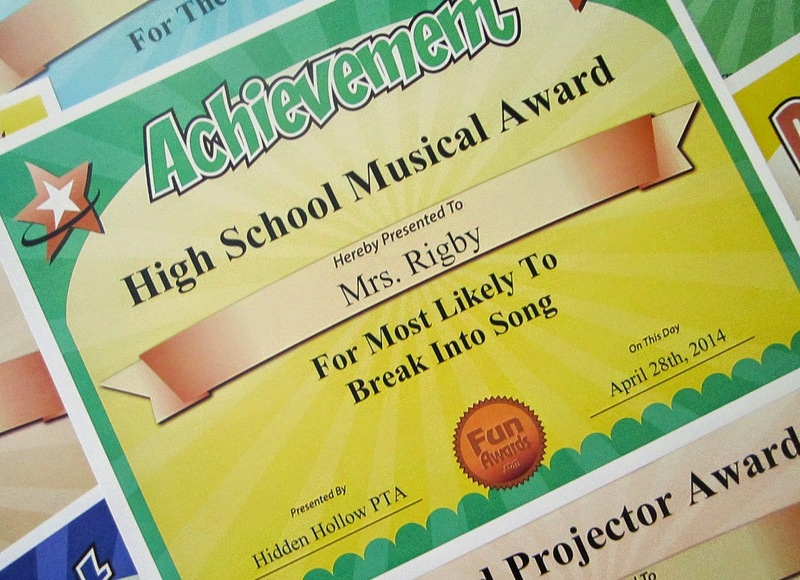 It's quick and easy to make your own funny award certificate titles and nominations. And thanks for 10 years of likes and shares! World's Best Dad Father's Day Certificate Free! Father's Day is just around the corner. And what better way to celebrate Dad than with a personalized gift from the heart? Or a tie. Not socks, though. No Dad wants that. The best gift for Father's Day is something homemade and from the heart. Quickly customize your own "World's Best Dad" Award Certificate with our free printable PDF. 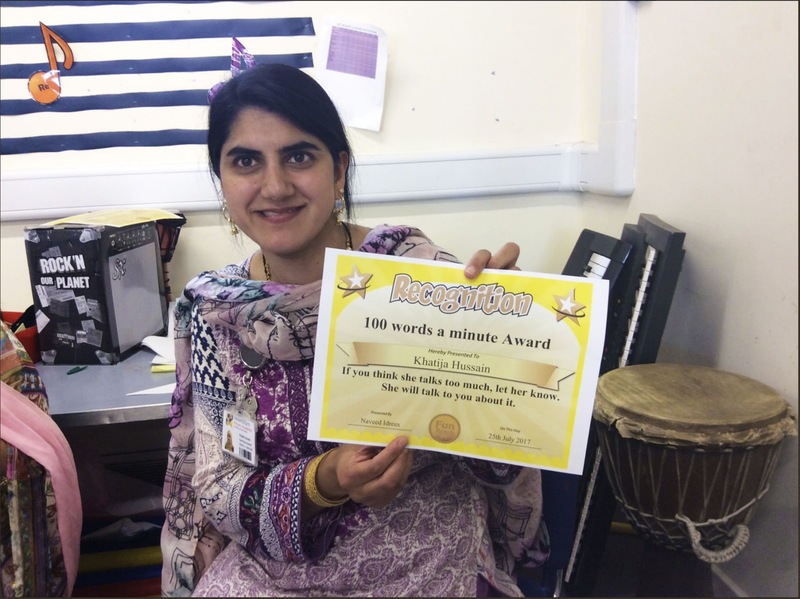 You can type directly onto the certificate template and add your own message before printing. 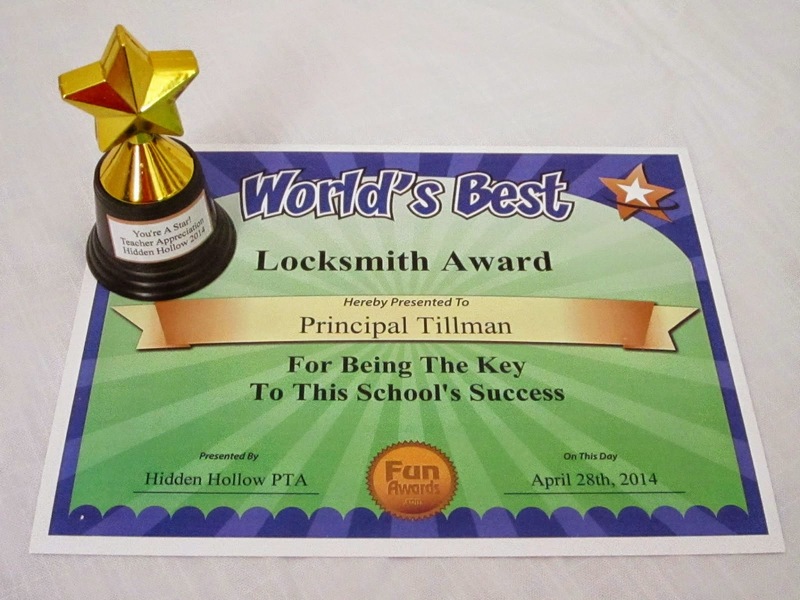 Within seconds you'll have a unique award that will put a smile on your Dad's face! Just click the link to download the PDF and enjoy! You could also create your own certificate from scratch using water colors and a Sharpie. Either way, your Dad is going to hang this keepsake on the refrigerator where it will remain for the rest of your life. Do you want your 10-years-from-now girlfriend to see your water color disaster that you threw together the night before Father's Day? Will she think it's cute, or will it be an ongoing source of embarrassment? Just print out this Free World's Best Dad Father's Day Certificate and be done with it. And tell your Dad you love him. He won't be around forever. Teacher Appreciation Week is here! Also known as National Teacher Week, it occurs on the first full week of May in the United States and Canada. Teacher Appreciation Day occurs on Tuesday of Teacher Appreciation Week. If you want to do it up right, see if you can top the fine folks over at "Sweeten Your Day Events". In 2014, they threw a themed Hollywood Teacher Appreciation Week at their school, entitled "You're a Star". "One of the most popular things that the teachers look forward to during this week are the door decorations! About 2 weeks before the event I put up flyers around the school to get the students and teachers excited. We also sent home reminders sheets to all the students of the daily activities so they could come prepared. Each day we treated the teachers and staff with food or refreshments in the lounge to enjoy. Each morning we had the principal play a little Oscar music and announce a few funny teacher awards over the speakers. It was a great way to spotlight everyone. 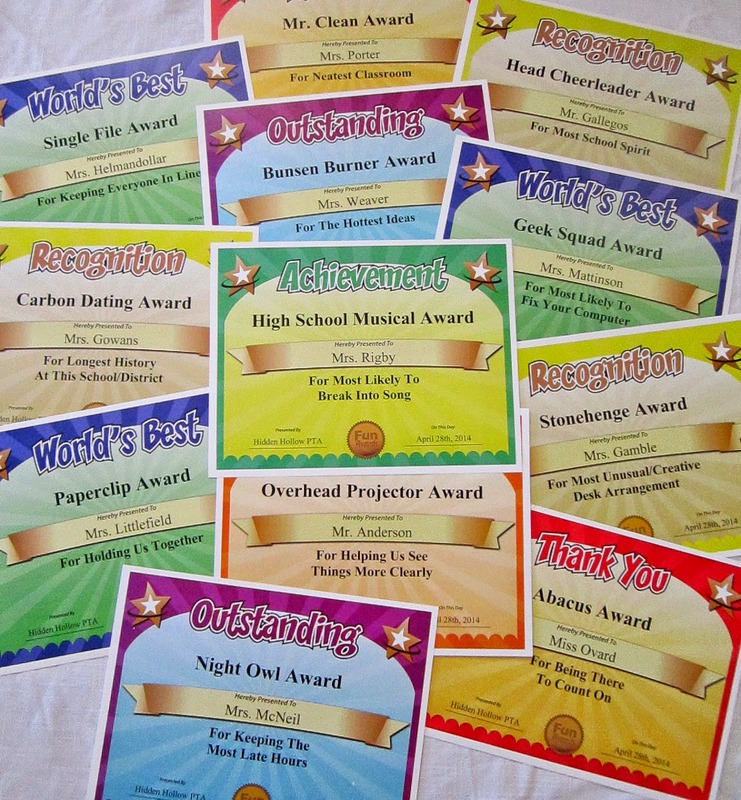 Here were some of my favorites..."
These are from my collection of 101 Funny Teacher Awards. I have to tell you, it feels good to see how people make fun and creative uses of these awards. They really went the extra mile! "We went around to all the classrooms and delivered the certificates along with a little star trophy. 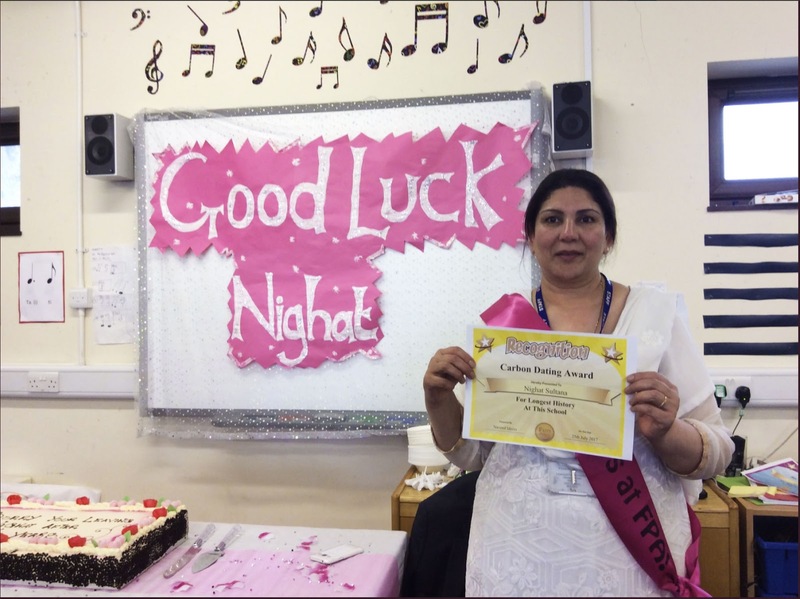 The kids all clapped and cheered for their teachers, so adorable!" Small trophies with the award add that extra touch! Thank you to Jen H. for your wonderful ideas. I hope it inspires you all to have the BEST Teacher Appreciation Week ever! Teacher Appreciation Awards - Live!